The kittens have a big day ahead - they're going in for a round of vaccines and micro-chipping. They never enjoy the needles, of course, but they enjoy all the love and attention they receive when they visit the shelter. They are always quite popular with the staff and volunteers. I weighed Fiona before breakfast and even with an empty belly, she weighed two pounds. She's the last to cross over the mark, so hopefully we'll putting them all on the surgery schedule for early next week. Which means that this time next week, we'll be Lively-less! Oh dear. Are you ready for that? 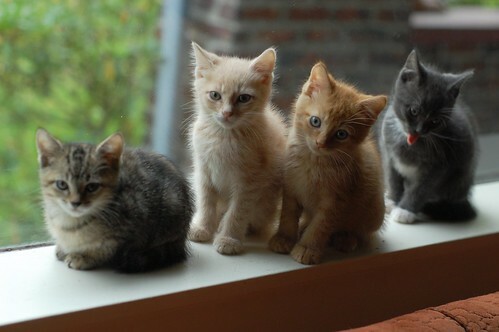 Today I have the last set of group shots with ALL the kittens to share with you. I think I took these pictures post lunch and pre nap because some are licking their faces clean and some are dozing off. 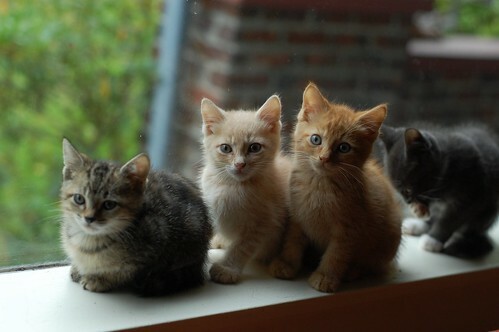 Like all kittens of our have discovered, the window is the best place to be on a sunny afternoon. Love that last photo--I just can't believe how orange Irving is, especially compared to Lambert! 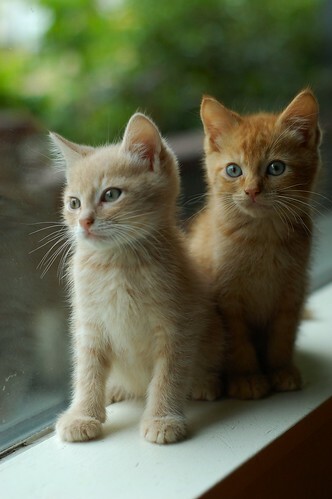 These are classic kittens. No wrinkly hairless bodies, no smushed faces, no slinky Siamese physiques. Not that there's anything wrong with those kinds of kittens -- there isn't. Okay, maybe I'm not so cool with the hairless ones -- I'll admit it. Of course, if I had one, I'd love it to pieces. 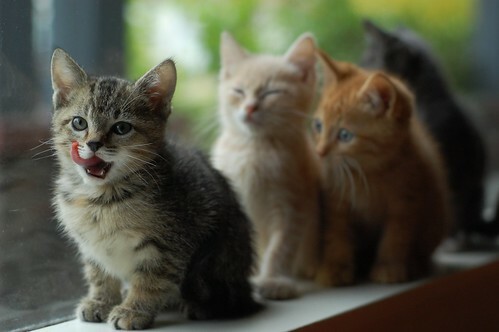 But this group of kittens is classic and charming and I love them. Traditional tabbies of various colors, a sweet gray tuxedo cat -- sturdy little kitten bodies and clear little kitten eyes. Heck, I bet there's a decent mouser amongst them! I thoroughly enjoyed the Lively kittens, as I expect their new homes will. Thanks, Laurie! I love pic #4, with Mr. Morning Suit's tongue hanging out! 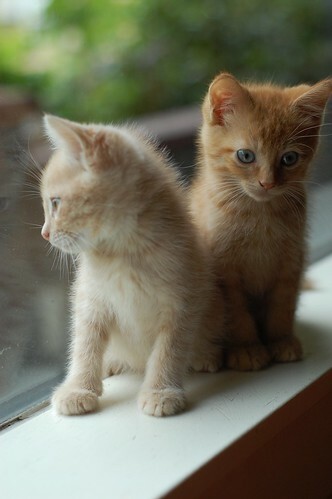 What adorable kittens. I love the pictures you get. My bottle baby gets vaccinated today and I am anxious to see how much he weighs!! It is always hard to give them up but you do great work with them!! I'm never ready to say goodbye to the itty bitties, but I'm happy they have forever homes, and I look forward to the next wee ones. Oh noes! I was hoping we would spend Halloween with the Lively Bunch! Ah well, as long as they go to loving homes, I'm happy. They are all so adorable - but I especially love cutie Fiona in the first pic! Such a cute, tubby bunch of babies...I'll miss them...and look forward to the next. Give 'em all a kiss for me. Oh, Irving is so very pumpkiny orange. I think he's my favorite. How do you get your Cats and Kittens to pose like that? its alsome!!!!! Oh they are all just adorable. Laurie you must have amazing will power to take on these beauties and then let them go. Just gorgeous photos!! Oh man, that photo of Irving and Lambert and Lambert's zen moment in photo 7... divine. So hard to believe, even after seeing our little man Lambert in his big grown-up collar. They all look so unutterably soft and contented. Oh, Mr. Irving and those baby blues. I'd never get anything done, if he were in my house. What every windowsill needs! Ohmygosh, the lil tongue in the first picture! They are the cutest little babies ever! Yes - in #1 the duo of Fiona's toungue backed up by LOL's "Happy Cat" expression on his face! Sigh...the Lively's have been a joy! 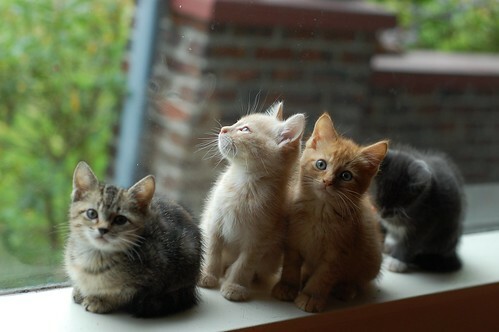 About now, I'd like to grab them all off the window sill and give each a whole bunch of kisses, and snorgle them. Do the local Police provide traffic control outside your house, to keep the adoring fans moving on. Or do you just let them gather hoping to spot the Itty Bitties or even the Bean sunning themselves in your windows? Awwww they are just adorable and so perfect! Squee! 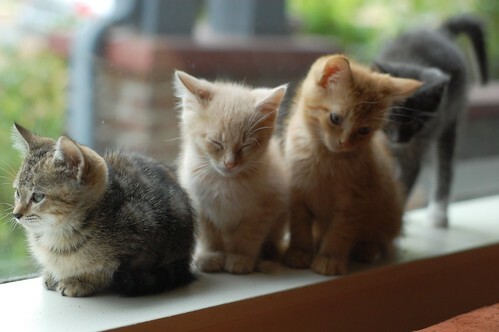 There's something about these little kittens all lined up in a row that just does me in. Aww look at these, what a great picture. I just LOVE LOVE LOVE your website. I wish you were local so I could adopt...but I would surely end up with too many kitties. 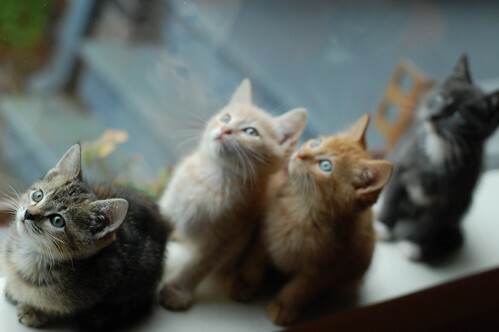 The pictures are amazing and the kittens are so cute I can barely stand it. I could spend hours looking at them all here! Thank you!